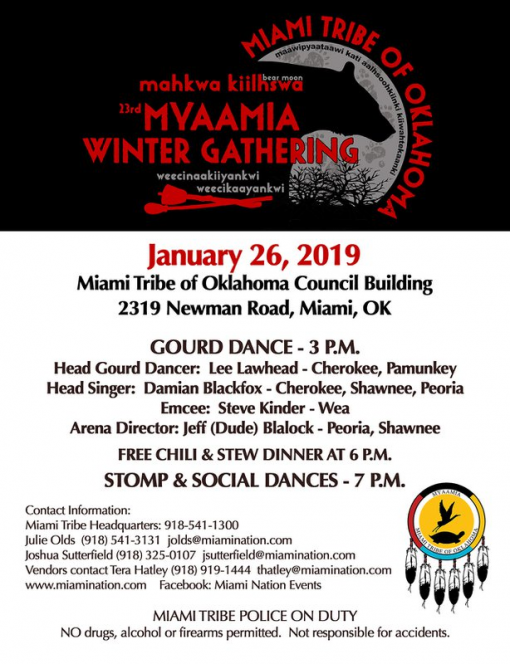 Come and join the Myaamia Winter Gathering & Miami Tribal Stomp Dance in Miami, Oklahoma on January 26th. This event near the Grand Lake Ok area offers immersion in the Native Indian culture. The gathering will take place at the Miami Nation Council House located at 2319 Newman Road. The celebration of will including various dances including gourd, stomp, and social. The event will also include a no-cost chili and stew dinner for guests. This family-friendly event is a wonderful way to learn of the culture and see regalia. For more info, please call 918-541-1300.